Residents walk through the Bakara market area of Somalia's embattled capital Mogadishu, in 2011. Somalia's war-ravaged capital Mogadishu will host Thursday its first ever TED talks as part of efforts to showcase improvements in development, business and security, organisers said. Somalia's war-ravaged capital Mogadishu will host Thursday its first ever TED talks as part of efforts to showcase improvements in development, business and security, organisers said. "It is part of Somalia's regeneration, to show that a turning point has been reached after so many years of conflict, and that we are witnessing the rebirth of Mogadishu," said organiser and speaker Liban Egal. 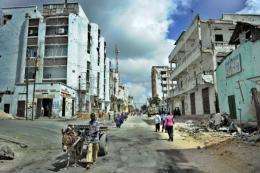 Eight months after Al-Qaeda-allied Shebab insurgents abandoned fixed positions in Mogadishu following pressure from African Union and government forces, the capital is showing signs of life, with reconstruction under way. Egal spent 24 years in the United States, before returning to his birthplace Mogadishu to open First Somali Bank earlier this week, the first commercial bank to open in southern Somalia since the government collapsed in 1991. "Security challenges remain, but there is hope in Somalia, and international investors are exploring opportunities," Egal added. The Technology, Entertainment, Design (TED) conferences began 30 years ago in California as an annual haven where elite thinkers got together to explore life from challenging or unusual perspectives. The main conference allows one-off gatherings elsewhere using a "TEDx" label. Speakers in Mogadishu include entrepreneurs, human rights activists, aid workers, academics, all but one of whom are Somalis. Around 100 people are due to attend the series of talks in a conference hall in Mogadishu, but it is hoped many more will watch the meeting via the Internet at tedxmogadishu.com/ . "It is aimed at the Somali diaspora to show them the opportunities here and how security has improved, as well as to a wider international audience," Egal added. Fighting erupted in Somalia in the late 1980s, escalating into a brutal civil war following a 1991 coup, with rival militias, warlords and Islamist fighters battling ever since for control of the lawless nation. Somali forces and an 11,000-strong African Union force have made significant gains in recent months against Shebab militants, but the hardline fighters are still able to carry out deadly attacks in Mogadishu. In recent months, the international community has revamped efforts to resolve the protracted unrest that has resulted in the country being carved up by warlords, extremist militia and pirates ruling vast regions.